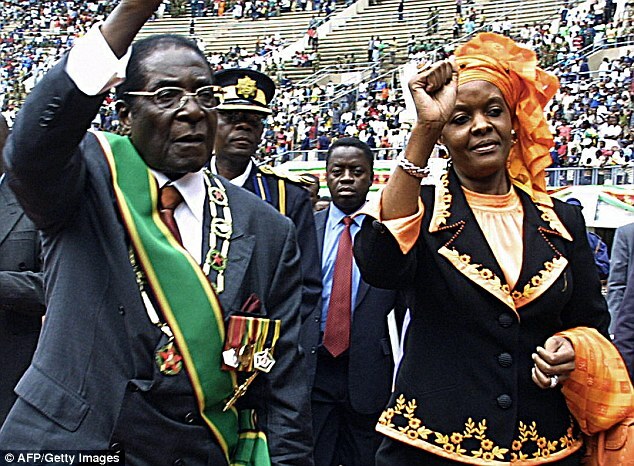 ZIMBABWE – Grace Mugabe has developed her own devilish way of attacking and dispatching her political rivals; first she accuses them of plotting to unseat her husband by starting and fanning the factionalism and division within the party, when in fact she is the one starting and fanning the war because she fears that her rivals are getting more popular than her and her husband. Then, under the disguise of the peacemaker bearing the olive branch, she savagely attacks her rivals, destroying their support bases and building her own. Whilst it is actively encouraged to support Grace in the race to be Mugabe’s successor; anyone seen supporting her rivals in this rat-race is now guilty of a new crime called “factionalism”. “Kuro imbwa wakavhinga mupinhi!” is what the Shona would say about Grace’s devilish modus operandi. The English equivalent would be the bad wolf attacking the sheep downstream accusing them of mudding his drinking the water! Grace used her simple and very effective devilish scheme to ouster Joice Mujuru and her followers; the simpleton and her followers did not see it coming and they scattered in all direction in total confusion. Grace launch her attach in August out of nowhere by December, in time for the party’s elective congress, her husband was able to deliver the coup de grace on Mujuru and her supporters! VP Mnangagwa now standing in her way to be Mugabe’s successor and she is using her tried and tested dirty tactics on him. She was in Chimanimani to further the interests of her new G40 faction fighting to wrestle control of the party from VP Mnangagwa faction which emerged as the strong side after the more popular Mujuru group was booted out last year. The G40 faction never existed, Grace is the one who has started it and is building it up! President Mugabe and his wife did not have much trouble “baby dumping” Joice Mujuru and her followers but doing the same with Mnangagwa and his supporters will not be so easy! “Generation 40 is just a nuisance to the party. There are cronies of diversionists coming from power-hungry clowns misguided by errant professors from nowhere who have found their way into the party,” hit back Minister Chris Mutsvangwa, a known Mnangagwa supporter. “No single fisher organisations has succeeded outside the legitimacy conferred by the liberation war. They mean nothing and will fail the way the Mujuru cabal failed…they should stop it now. They won’t succeed against war veterans, they are too young,” he continued. I beg to differ there with Patrick, for all their macho bravado Grace and her G40 faction are much too weak and feeble to take on Ngwena (crocodile) Mnangagwa. The party is still licking its wounds from its dog-eat-dog fight with Mujuru and her supporters, many of whom are still in the party and will hit back from within; it would be foolhardy to trigger off yet another fight by booting out Mnangagwa and his followers too. Ever since Grace Mugabe bust into Zanu PF politics last year she has mudded the party’s already muddy waters to ouster Mujuru, her greatest rival to be her husband’s successor. She soon realized that she was not going to have it all her way as VP Mnangagwa emerged as the front runner. The succession rat-race is hotting up and Grace is way out of her depth and the minute Mugabe dies she will know just how dangerous a provoked crocodile can be especially in these mudded waters – he is in his element.